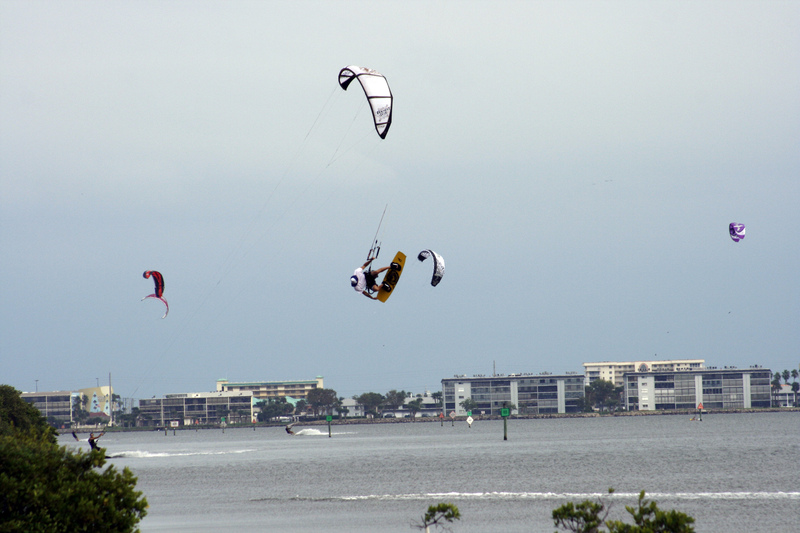 Cocoa Beach offers some of the most amazing kitesurfing spots in Brevard and Florida. It is also known as "Orlando's closest beach" with a quick trip down the Beeline (528). This is the place to go if you are visiting Orlando. There are usually great waves in the ocean and incredible flat water spots in the Banana River. The river along Cocoa Beach offers ideal flat, shallow, warm water for learning. The launch areas for the river can be kinda dangerous and a boat or wave runner is recommended. You can easily boat out and launch in the flats or from one of the islands. Cocoa Beach has the ultimate in outdoor recreation - Kiteboarding, fishing, swimming, surfing, boating, Standup Paddleboarding, tennis, golf, marinas, kayaking, and boat ramps. Here are some brief overviews of some the main riding spots in Cocoa Beach. More info is provided on their specific pages. This spot is slightly off of A1A in Cape Canaveral. You take the Central (traffic light at Mc Donald's) East toward the beach and head South a couple of blocks. The park will be on the left hand side. There is a large parking area. This spot offers a wide beach at low tide. 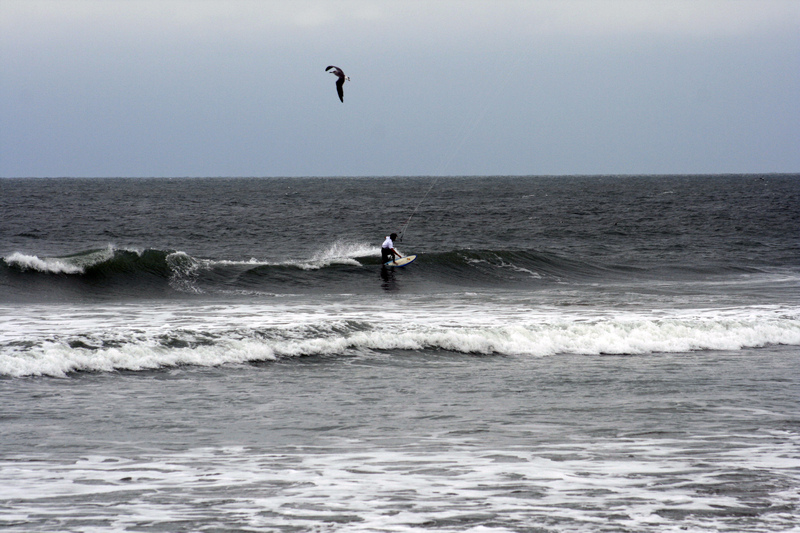 It is a popular launch site for kiters and windsurfers. The park offers bathrooms and showers. The waves here can get really big! PRECAUTIONS: This spot can get very crowded on weekends and holidays. Avoid kiting around crowds and find an alternate spot. DO NOT KITE IN THE LIFEGUARD AREA! WIND DIRECTIONS: Good from NE, ENE, E to SSE, SE, S winds. This is the Banana River on the South side of the 520 causeway. The park is actually called Bicentennial Park. It is right near the "Cocoa Beach" welcome sign. It is across the road from the hospital. People normally set up and walk through an opening just west of the public boat ramp parking. A water launch is the safest thing to do here. The setup area is right near the causeway and mangroves. A North wind here is straight off-shore which creates an amazing glassy slick. You get Hatteras like conditions here. The water is shallow as far as you can see except for the boat channel which is marked. The bottom is mucky and some people prefer to wear booties. There are some random sharp objects on the bottom. There are tons of dolphins and manatees around here. PRECAUTIONS: Advanced level riding ONLY without boat or instructor assistance. This spot has a very technical launch. Do not ride this spot if the wind is blowing from the south toward the causeway! An accident can easily result in injury, cause the spot to be closed or a deadly car accident. PLEASE LAUNCH FROM THE WATER!! It can be very shallow in areas so use extreme caution. Keep an eye out for the markers so you do not hit them with your lines. Foot protection is recommended if you plan on walking around much. WIND DIRECTIONS: Good from anything with N, NNW, NW to W wind component. Located in Cape Canaveral on the NE end of the Banana River. There are a couple open fields ideal for flying trainer kites and riding land boards in west winds. The water access is obstructed by a large boardwalk. Launching here is very tricky due to the trees and boardwalk close to the waters edge. There is a deep channel near the launch extending about 50 feet out and then it is really shallow beyond that. Once you are up and riding, edge out west to find a sweet slick caused by a shallow sandbar. This is one of the most amazing spots to watch the sunset. PRECAUTIONS: Intermediate to advanced level riding ONLY without boat assistance. This spot has a very technical launch. Watch out for the mangroves and boardwalk! Manatees can easily scare you since they do not move until you are basically on top of them. Then they go into this thrashing movement. It can be painful if they hit you for both parties. They are often covered in barnacles. WIND DIRECTIONS: Good from anything with S, SW, W, to WNW, NW wind component. This spot is good on summer days when the Seabreeze kicks in. It can blow about 5 mph more here than on the beach! The windsurfers here are NOT always friendly to kiteboarders. This spot is NOT recommended for kiteboarding. If you do decide you have to kite here, go later in the afternoon when the windsurfing shop is closed and be respectful!!! The beach area is very small and not the best spot to launch. There is a field behind the parking lot which offers an open area to setup and launch. It can be gusty and you must walk with your kite through the parking lot and trees to get to the water. Again, this spot is NOT recommended. You can launch a boat here and go out to the flats just South to launch. PRECAUTIONS: Advanced or PRO level riding ONLY without boat assistance. This spot has a very technical launch. It usually good when there is an Onshore wind which means you will be pulled into the buildings and trees if something goes wrong! Watch out for windsurfers and other spectators. Good Breeze Kiteboarding/Ron Jon Kiteboarding offers certified lessons with watercraft support in flat shallow water. Equipment is available in the full pro shop in the heart of Cocoa Beach. The retail store is across the street from the main Ron Jon Surf Shop on A1A. Located in the Winn-Dixie (Canaveral Plaza) shopping center.